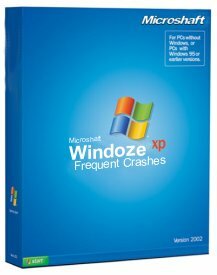 The Frequent Crashes Edition of Windoze XP is for power users who want an operating system that quits when they need it the most. 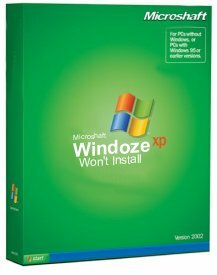 Each user can access his or her files anywhere on your Windoze XP network with a username and password, and any 13 year old with any hacking knowledge whatsoever can access your Quicken files without a password. Since privacy is a word we are somewhat familiar with, this edition of Windoze features file encryption. For added security, no file decryption is included. This mouse has no balls; that's right, it's female. Also, it glows red for some reason. You could use it as a flashlight if you wanted to, or maybe it would make a good decoration at the rave you've been planning. 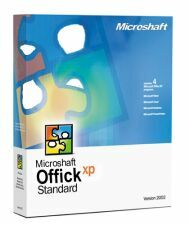 Offick XP includes four Microshaft products: Werd XP, Axel XP, and a couple of others that we can't be bothered to remember at the moment. In case you missed all our commercials, we have removed Banty the Bent Out Talking Paperclip from this version. NOT! Just kidding, guys, he's still there after all. Now, he thinks you've rejected him (he's right, isn't he?) and he's meaner than ever. Watch as he takes your documents and "recycles" them when you're not looking. Also, he randomly inserts expletives into your Werd documents and changes the numbers in your Axel spreadsheets. What a jerk!